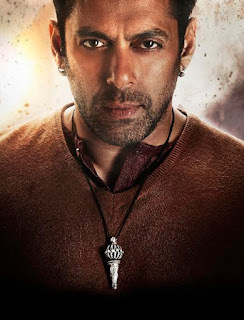 Mumbai, July 8, 2015: Silvostyle, in association with Bollywood superstar Salman Khan’s first home production ‘Bajrangi Bhaijaan’ forays into movie merchandising by exclusively launching the official Bajrangi Bhaijaan pendant. This pendant by ‘Silvostyle’ is beautifully crafted and cast in 60% silver. The design of the pendant is the replica of the pedant designed by Ashley Rebello and worn by Salman Khan’s character in the movie. The pendant is available in two sizes i.e. 2" priced at Rs. 1195/- and 1.5" priced at Rs. 795/- and comes with a 30" black thread, just the way the superstar is seen wearing in his upcoming film ‘Bajrangi Bhaijaan’. The originality and authenticity of this stunning piece comes from the fact that it comes with a personal message signed by Salman Khan. The pendant comes in a stylish Silvostyle box enclosed with a special card autographed by Salman Khan. In the film, the pendant is gifted by Kareena Kapoor, who plays Rasika in the film, to Salman Khan, who plays Pavan in the film. With this trendy and fashionable pendant, Silvostyle aims to reach and touch the heart of millions of Salman Khan Fans across the nation with this exclusive movie merchandise. The pendant will be available across all Silvostyle, P. N. Gadgil Jewellers and Being Human stores and online exclusively on Amazon India. The on ground presence will be about 120 outlets across the country. In a first, amazon.in has opened pre-bookings for the pendant and the response to advance bookings has been overwhelming. “Amazon.in, is India’s largest online store, we are the perfect partner to launch the exclusive Bajrangi Bhaijaan pendant. With our fast, easy, convenient and reliable shopping experience, we will be able to deliver the merchandise to more than 19,000 pin codes. It’s exciting to be able to reach out to a wide fan-base of Salman Khan through our trusted online platform and we look forward to seeing a great response from our consumers.” Says the spokesperson of Amazon. Style Quotient Jewellery Pvt Limited, are creators of exquisite silver jewellery. This in-house brand is functioning under the leadership of Mr. Prasad Kapre, a world renowned visionary in the Indian Jewellery Industry. Silvostyle specializes in unswervingly creating unique and quirky oxidized and sterling jewellery pieces through techniques like tassel stamping, enamelingg as well as Jadau with aesthetic designs, innovative techniques and craftsmanship aiming to create a ‘Jewelvolution’ (revolution of Jewellery). Catering to women from all walks of life their intricate and contemporary designs are chic yet affordable.